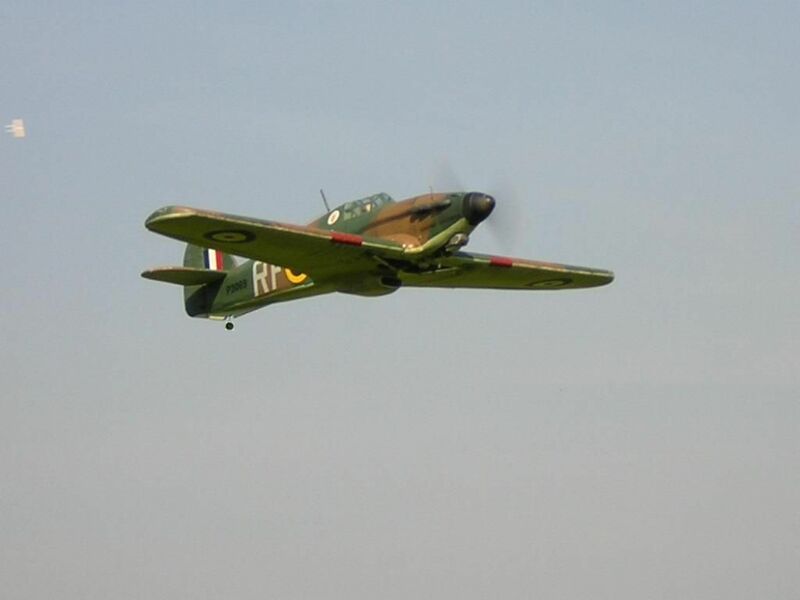 We at High Wycombe and District Model Aircraft Club (HWDMAC) are having a group winter build of 55-65 inch warbirds which we will then fly together at our after work 'Warbird Wednesdays' when the summer comes around again. The objective was to encourage building and then have a laugh flying together as a social event as much as anything else. There was also the objective of teaching building skills to newcomers to the kit building scene as well as teaching the tricks of warbird flying to the guys who join in and build a model. There will also be a prize offered to whoever is first to rip out his retracts due to a crummy landing! Kits so far are all from Warbird Replicas and Richard helped us out by getting the batch of kits together for me to collect in one lump. So far we have 4 Yaks, a Spitfire and my own soon to be started Hurricane on the go with another Hurricane and another Spitfire as potentials with their prospective owners mulling things over. So anyway, the purpose of this thread is to show off the work already complete, chat about issues, and hopefully entertain the masses here on the forum. I had one of the hurricanes many years ago and it taught me a lot. So the idea of building another appealed to me both in terms of nostalgia and because I can do a better job this time. I am sure the other guys will post their progress soon. Not all are forum members yet! One q, if I may. The Warbirds Replica site quotes the Hurri's weight as "9-10lb". Is that right? It seems a heck of a lot, especially when the other models in the range are quoted as 5.5 - 6lb. Ok the Hurri has a foam wing and is larger than the others, but only slightly: From your previous build was it really 9-10lb - up to 4lb heavier than the Spit, Mustangs, 109 et al from the same range? The hurricane above was about 9.5lbs if I recall and was a bit of a hefty hector. Mostly due to the masses of lead in the cowling. It flew fine with the Laser 80 I fitted but landing was a challenge. That said, it was my first warbird build and I was not as good at flying them as I am now. Lighter back end. Holes will be drilled in the horizontal and vertical stab with a hole saw to make them lighter. I may even do a full built up tail instead of the slab balsa in the kit. Simpler cockpit. The last one had a full length pilot and this meant moving the servos behind the wing. All of this was bad for c/g. Longer nose. I plan to make the nose longer. Only by 1/2 inch or so but just a bit so I can get the weight forward. Metal spinner. The original had a plastic one so a metal one adds weight as far forward as possible. I will most likely add flaps to help on landing. Lighter wheels. The dubro ones I used last time were like bricks. Some lighter ones will be used and I might even use foam wheels as they retracts behind the c/g. With these mods I hope to get the amount of lead needed in the nose down a bit and thus reduce the overall weight. I am aiming for 8lbs....Time will tell if I make it! I got a bit more done on the Yak. 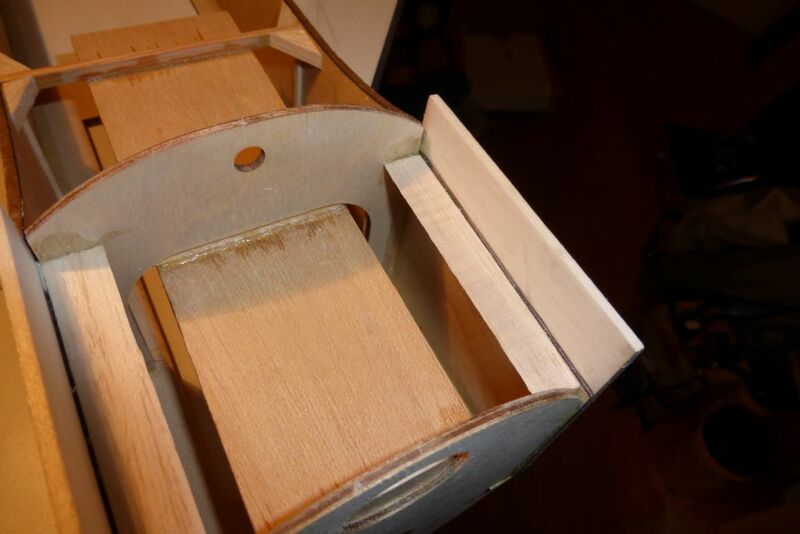 The fuselage sides take a lot of effort to bend to the profile of the crutch plate so I decided not to chop anything out of the firewall or crutch for the battery tray until I fit the battery tray to preserve the rigidity of the front end. Chop & glue the triangle section balsa to the fuselage sides - I used aliphatic resin spread just thinly enough on both mating faces so that when pressed together a fine bead of glue got squeezed out. I used pins to hold the components together. Whilst that was gluing I buffed the laser cutting ash off of the formers and crutch plate. By the time that was done the glue had well and truly grabbed so I trial fitted formers and fuselage sides to the crutch plate. After devising a way to get the assembly jigged I glued (using aliphatic resin) formers F1 & F2 to the ctruch plate and glued the fuselage sides to the formers and only the parallel section of the crutch plate. She is coming along slowly but surely, my pace is more pedestrian than motorway. This stage is all about pulling the tail section of the fuselage together without twisting or distorting it so I tackled it in 4 stages checking the that the fuselage sides were square (thanks to Jonathan's CD trick) at each stage - it hasn't come out too bad. Gluing F3, the wing bolt plate and a little more of the fuselage sides to the crutch plate: I found this tricky, initially I hadn't envisioned including the wing bolt mounting plate but found that it was necessary to keep the fuselage sides from bowing out when they were clamped to F3 and also to prevent F3 from bowing under the strain of the clamps. As I didn't want to wait all day for the glue to dry I used 30min epoxy, the plan being to mix up more than enough, apply it to both side of the mating faces, assemble and clamp the parts and then, with what is left, mix in some milled carbon to use as fillet to add some strength. I should be used to my working pace by now and by the time the parts were glued, assembled & clamped and the milled carbon mixed into the resin, the resin was beginning to cure so it resulted in the mess shown in the photos. Gluing another 3" of fuselage sides to the crutch plate: following a cup of tea the epoxy had cured and the clamps could come off. I didn't want this to take all day so I used a cocktail of CA adhesives and CA filler. Ensuring that the sides were perpendicular to the crutch plate when clamped was bit fiddly but once clamped it was a matter of running thin CA down the join line. In order to bolster the join I made a fillet with some CA powder filler and dripped the CA over it and finished the joins off with a smear of medium CA. Gluing down to the tail area: by this stage it was much easier to clamp the fuselage sides to the crutch plate so it was more thin CA, filler, thin CA and medium CA. Final run to the end of the fuselage: annoyingly the back end of the fuselage sides didn't naturally meet up with crutch plate but the sides did perfectly line up with each other. Upon checking on the crutch plate side it could be seen that I hadn't glued it inline with the top of the fuselage sides - not all that important as the sides lined up. As there isn't enough space to get the CA bottle in I used aliphatic resin and used a spring clamp and a rubber band to hold it together while glue sets. 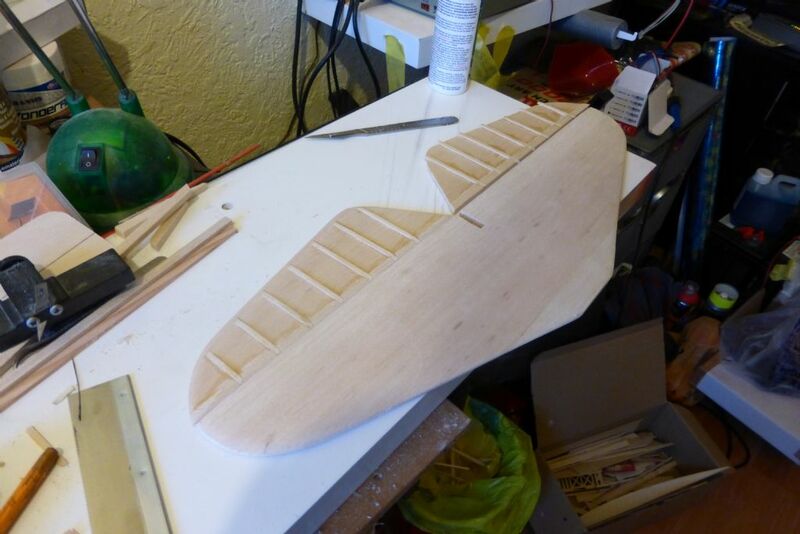 In amongst all of the above I trimmed tail end of the triangle section balsa on the bottom of the fuselage sides. I was hoping to make it a really nice fit but it came out a bit gappy, it's not a big deal as the cross grain sheeting will be plenty strong enough. More pictures have been added to link in my last post. Well I have cleared some space in the workshop to get the Yak going. Nothing much to report yet. Planning on going for a 4 stroke engine in mine plus as Graham has done, and others are planning to do, I will be adding flaps. Firstly I was sorting out what electronics I have got 'spare' and what I'll need to buy - primarily servos - and here comes the first questions and/or helpful hints. The very nicely designed aileron servo boxes that come with the kit don't naturally seem to be designed for your standard size servo - servos are slightly to large. Now when I say standard this to me is your Futaba S3003 or S3001 and the like. Servo technology has moved on a lot these days and these larger servo's do seem very large by comparison these days, but often cheaper and readily available so something to be aware of. I have a Hitec HS 225MG servo which seems to be a good fit so I will probably go with this and pick up another one to make the pair. Having been more involved with electric gliding recently my next question is would a 9g servo be good enough for the throttle control linkage? Have often though about this but never got to the bottom of it. Hopefully some updated and pictures coming soon!!! Brian, i would not be worried about the parts that did not quite fit right. It will all be alright in the end. I am surprised though as Graham reported perfect fits on all of his parts. Once thing i did spot in your photos is that the ply doubler just hangs down to the round part for F1 and this could make bending the sheet round a bit of a pain. Assuming it is bent round. I cant remember where those blocks go. Guy, a micro servo will be ok on throttle but just make sure they are as far from the vibration of the engine as possible. I have used 9g servos on throttle before and eventually the vibration killed them, but they were very close to the engine. For the ease of people viewing our thread can we post individual photo links in each post even if they are the highlights with more photos in 'the cloud'. If we get several pages of posts going on it could get confusing if we keep having to go back searching for album links! I appear to have mislead you, the supplied parts are an excellent fit, the wood choice is first rate as well. It was my cutting, sanding and gluing on a couple of components that was a little on the toilet side but I'm not losing sleep over it. I got the bottom of the fuselage sanded nice and flush, the laser cutting ash is an excellent indicator of how evenly the sanding is going and I reckon it's come out a peach! 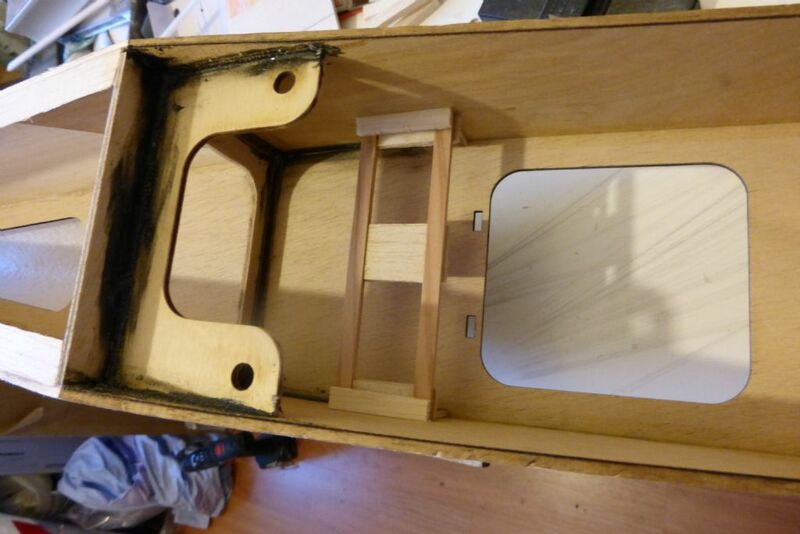 I reckon that the next stage is fitting the control rods/snakes and devising, making & fitting the battery tray. 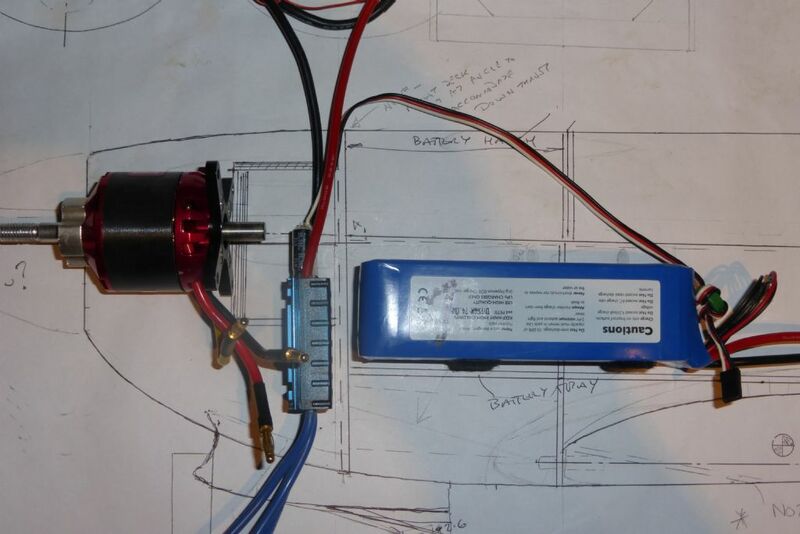 I'll be using 9g size servos, a cocktail of high torque (for a little servo) Savox and Turnigy 9018. I can't use the recommended servo positions because they are right where my flight pack will be so I will make a servo tray to fit just behind the cockpit opening. 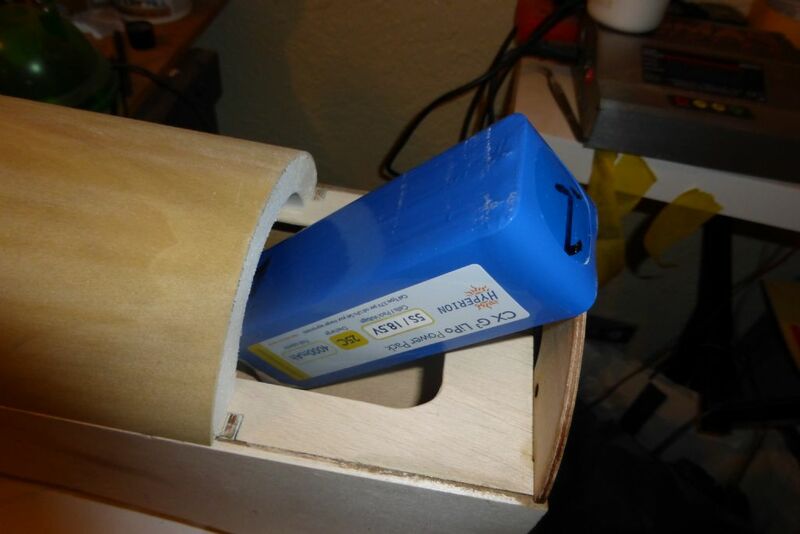 I'll see if I can go for push rods on the elevator and would quite like to go for closed loop on the rudder. Of course, and ball raced, the spec sheet reckons they have higher torque than a Futaba 148 - not that I'm entirely convinced of that. I see what you mean about the front end, I'll have proper look once I get onto that stage, from what I have seen on Graham's one that area is made from blocks and carved/sanded to shape. With a bit of luck I'll get the battery tray in tonight and I'll be able to have a look sooner rather than later - roll on 6 o'clock! Well i managed to make a little progress on the pulse. Once it is out of the way i am itching to get into the Hurricane build asap. I guess that it's of little interest as the rest of you are ic-ing but I've got the battery tray fitted and braced and an access hatch cut into the crutch plate. I intend to split the top deck just behind F2 and use the front section as the battery access hatch, the split line will be in the position of a panel line. 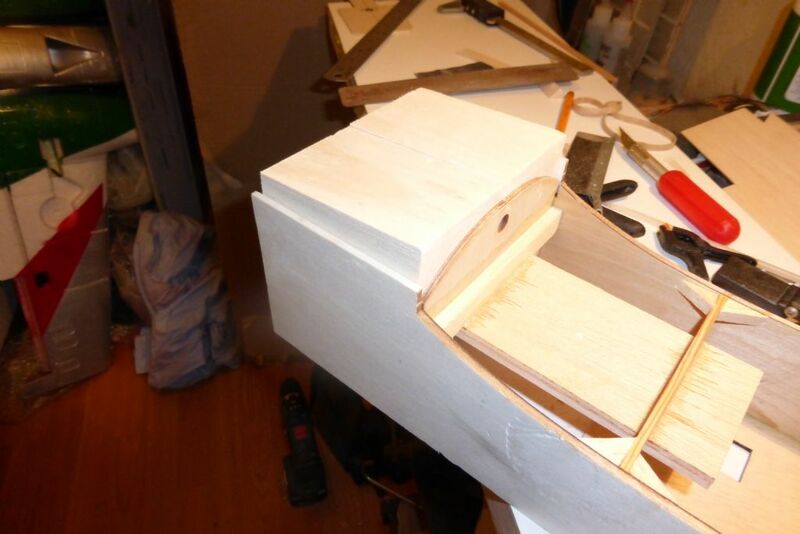 I also had a look at the lower part of the front fuselage, having consulted Simon's photos of Graham's plane (good call on taking and posting the pics Thanks Simon), I saw that it is make from the big chunky balsa blocks and triangle section balsa. The big chunky blocks aren't glued yet, I'll hang on until the wings are joined as it will be easier for me to see what's happening if I'm struggling with fitting the wings. The triangle section balsa has been cut and glued in. All of the pictures of this stage are in my album on this forum. At the speed you are progressing we should have called this the 2 weeks in January warbird build! She is going together pretty swiftly! For the benefit of those that haven't started, I would like opinions on whether or not it would have been better to glue the big blocks at the front and their triangle section balsa strip to the fuselage sides before assembling the sides to the formers and crutch plate. In my case it would have been beneficial if I had planned the battery tray in advance and fitted the necessary bracing to F1 & F2 but if you are building ic (or capable of planning in advance ) then I can't see that there is any need to wait. Personally i would assemble the box and then fit the triangles, and then the blocks. The last thing you need when getting the box straight is another variable trying to push it all out of line. Also leaving that area open is handy for drilling the hole for the wing dowel and (for those with engines) working out the fuel tank position before you are built into a corner. I haven't done anything ridiculously impressive, I spent a while planning out servo positions and push-rod/closed loop ideas. I'll go for push rods on both the rudder and elevator. I got the servo tray assembled and fitted, the servo rails are 1/8" x 1/4" spruce which I'll re-enforce with windings of carbon toe. Ironically the built-up elevators have come out heavier and less rigid than the solid 1/4" balsa ones. It will be hard to resist adding the balance tabs now that the ribs are in but I'll hold fire on that until I have hinged them. I should be in with a shout of getting some serious progress with the weekend forecast!